Super Bowl Sunday - What Will You Be Doing? Super Bowl Sunday – What Will You Be Doing? Super Bowl Sunday- What Will You Be Doing? So what are you doing on Super Bowl Sunday? Super Bowl Sunday will be a huge day for us Marylanders. 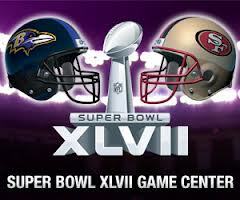 The Baltimore Ravens will be playing the San Francisco 49ers in Super Bowl XLVII in New Orleans, Louisiana. The Ravens have only been in existence since 1996 and have been to the playoffs 9 times AND won the 2001 Super Bowl against the New York Giants. This will be the Ravens’ 2nd time to the Super Bowl. Not a bad record for a relatively new team. The 49ers have been around since 1946, a whopping 50 years longer than the Ravens. The 49ers have won 5 Super Bowls in their history. Should be a good game. Personally, I would like to see the Ravens win on Sunday. I am a diehard, through and through Washington Redskins fan. But since my boys didn’t make it to the big show this year, I will root for the Ravens, since they are a Maryland team. I also feel that the Ravens have so much heart and determination to take it all the way. Super Bowl Sunday is one of those days, kinda like New Year’s Eve and St. Patrick’s Day, where you feel like you have to do some sort of partying and celebrating, even if your team isn’t playing in the game. So whether you’re just staying home, or having a huge blowout party, or going to a party and need to bring something, the first order of business is food and drink (beer goes without saying). Ya gotta eat and ya gotta wash it down with something. 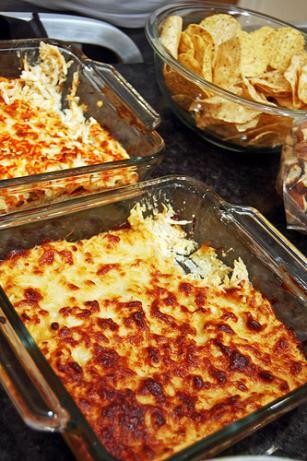 I did a search on Pinterest and found some really good looking football food recipes. Just click on the colored links under each picture to get each recipe. 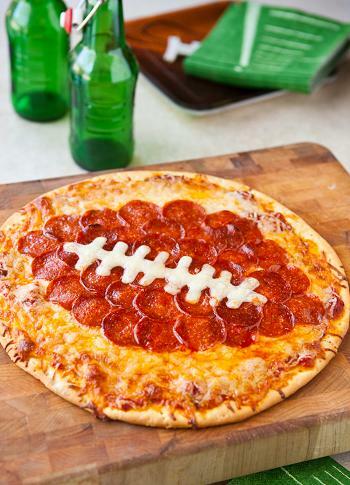 Found this awesome football pizza idea on blogs.babble.com. Super easy! Can’t watch football without some crackers and cheese. 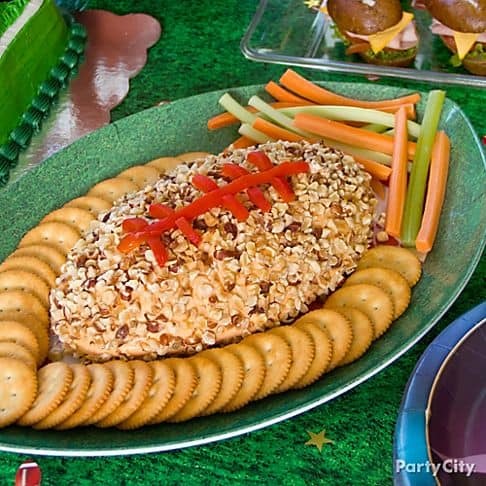 And what better way than to have a football shaped cheese ball. This recipe is courtesy of Party City. 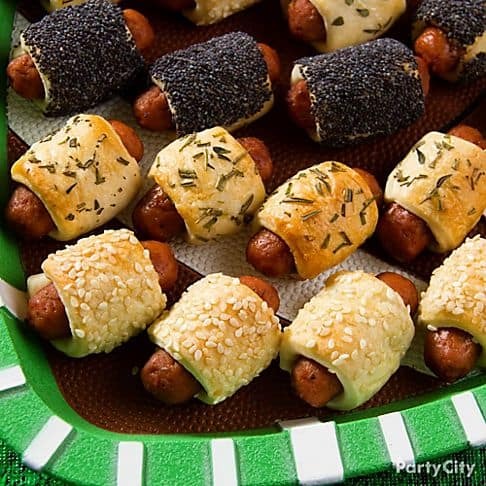 Another recipe from Party City is the trusty go-to, pigskins in a blanket. Yum! 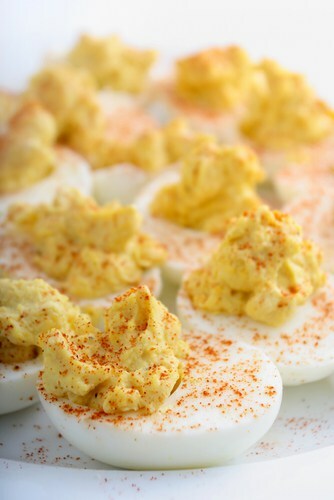 Another party staple is good ole deviled eggs. Personally I don’t like the fancified deviled eggs with extra ‘stuff’ in them. This recipe makes them straight-up – just the way I like them. Thanks to skinnyms.com for the recipe! A football food regular in my house is chicken wings. I decided that since many people will be at parties, socializing with other people, they might not want to be sitting there gettin down and dirty with some greasy chicken wings. This recipe is the next best thing. Chicken Wing Dip from Food.com. Yum-may! You just can’t sit and watch an entire Super Bowl without eating some nachos. It’s just what you do. 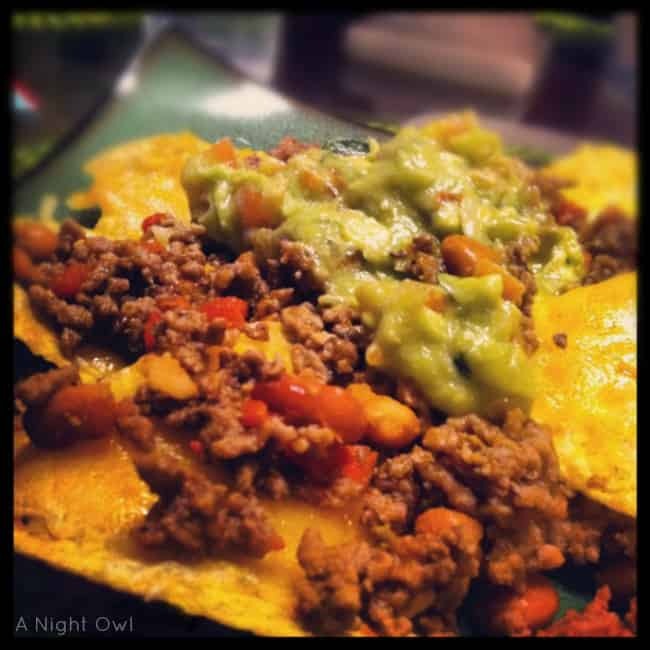 Found this amazing looking nacho recipe from a site called A Night Owl. Yes please! And you gotta have some veggies and dip on hand, especially when the game is close and you need something to crunch on to keep your nerves down. 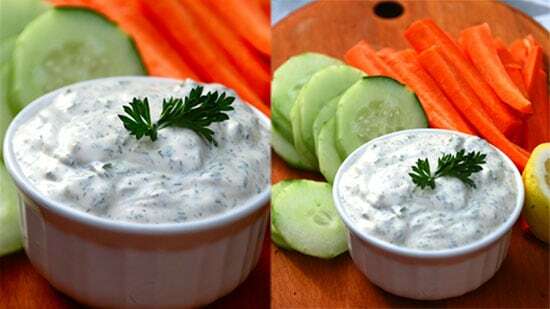 This Delicious Dill Vegetable Dip comes from a site called Little Yellow Barn. Now for the beverages. This recipe is for all of the Ravens fans out there. This drink comes from a site called SingleMindedWomen and is called Raven on the Rocks. Looks really refreshing! All it calls for is UV Grape (I’m assuming that’s grape flavored vodka), lemon-lime soda, and a splash of sweet and sour mix. Please and thank you! 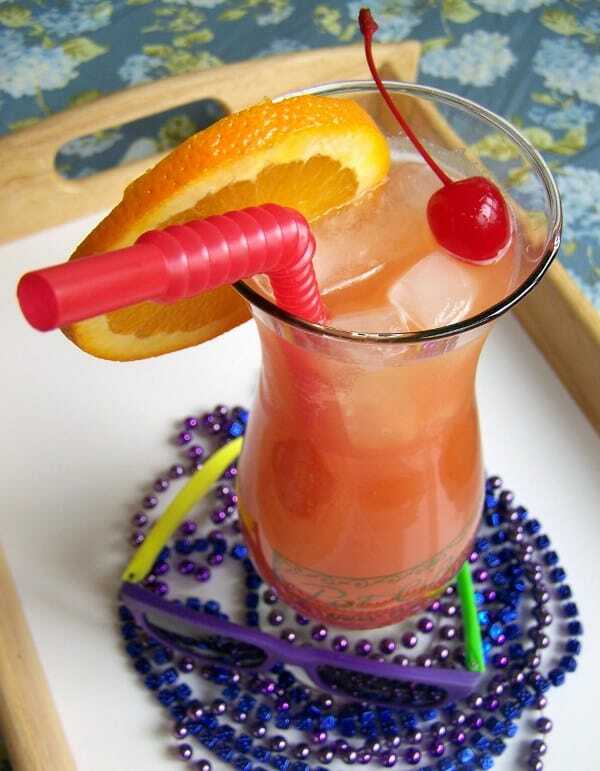 And being that this year’s Super Bowl will be taking place in New Orleans right around Mardi Gras time, what better drink recipe to make than the Housewives Hurricane! 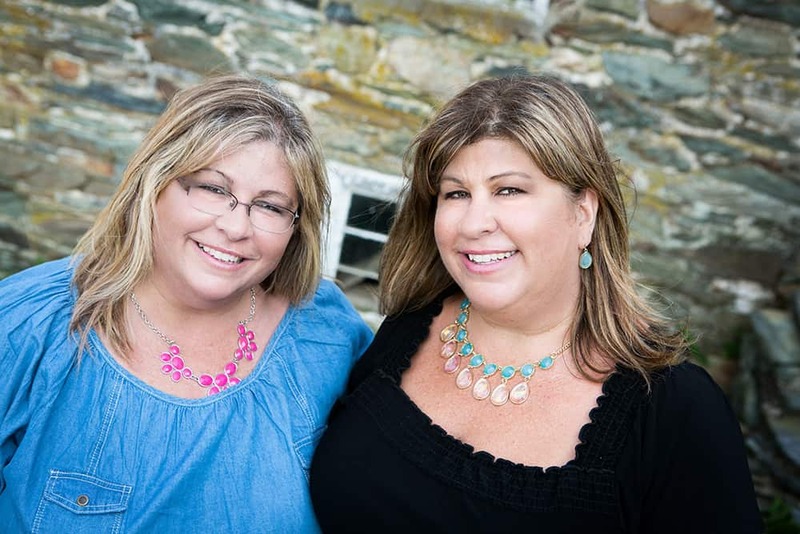 Brought to you from yours truly, the Housewives of Frederick County. So with all of these recipes, you should be more than set for eating and drinking while watching the Super Bowl at home or at somebody else’s house. Buffalo Wild Wings in Urbana (not sure if the one in Frederick is open yet). They’ll be offering their Tailgate menu with deals on larger quantities. Ceresville Mansion – Party starts at 5:30. Cost is $25 per person. They’ll have 9 big screen TV’s, quesadilla station, hot wings, italian sausage and hot dog station, and more. Cash bar and drink specials. Call to reserve your spot 301-694.5111. Family Meal – Come watch the big game at the best restaurant in town! We’ll have big screen TV’s, sick tunes, and awesome food/drink specials. The game starts at 6:30. Silent Old Mtns will play at half time, and after the game. Valley Grill Sports Bar in Middletown – Come in for our pre-game party starting at 4:00pm. Phil from 106.9 the eagle will be hosting all the festivities until the game starts. We will be giving away a leather recliner (thanks to Ashley Furniture) to get you ready for the next season of watching. And you can register at the pre-game party to win a $250 cash prize that we will give away at the end of the game. Plus we will be giving away lots of other good prizes. We will also have great beer specials to go along with our $15 all-you-can-eat appetizer buffet. Griffs Landing – has one of the biggest televisions around and will be serving a $10 Super Bowl Buffet including a Hoagie Station, Build-Your-Own Nachos, Hot Dog Bar, wings, pizza and more. They’ll have drink specials, too. It’d be a good idea to reserve a table, go with a fun group, and wear purple. Call 301-694-8696 to have them save you a seat. This is all I could find online, but if you know of any other Super Bowl festivities going on in the Frederick County area, which I’m sure I’ve just touched the surface, please comment and we’ll add it to the list. Have fun on Super Bowl Sunday and Go Ravens!! !